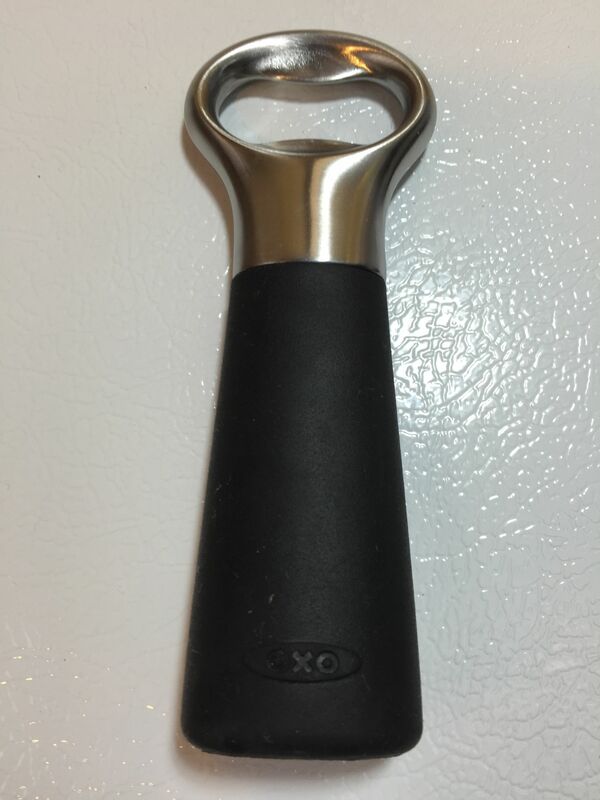 I have owned the SteeL Pop Top Stainless Steel Bottle Opener by OXO since April of 2013. Here are a few pictures and some thoughts about this bottle opener. Cool… this thing can open bottles! After some additional time using this opener I can say that it is the best opener I’ve used for leaving caps intact. If you open the beer with one continuous motion, most caps end up looking perfect. I’m wondering if it does this because of the stoutness and rigidity of the opener. In any case, I can recommend this for cap collectors. This bottle opener has a heavy, quality feel to it. In fact, the Top Find Fast Weigh MS-500 has it weighing nearly 6.5 ounces. This is made of cast stainless steel. It has a quality heft to it and it looks great. Apparently Craftsman Bottle Openers that look like wrenches are not suitable for the kitchen. If you bought one of those, your significant other MAY or MAY NOT hide it from you on a regular basis by putting it in the back of a drawer. 🙂 This one on the other hand has a real chance of sticking around. I have now used this great bottler opener for going on two years. If you look very closely you can see some very fine scratches. You have to look closely. The OXO SteeL Pop Top Opener continues to work and look light new. Very obviously cast stainless is a great material for a bottle opener. This is a great bottle opener that I can heartily recommend. It works great, is built to last and looks beautiful. Beyond using it for yourself, I think it makes a nice (and generally economical) gift. 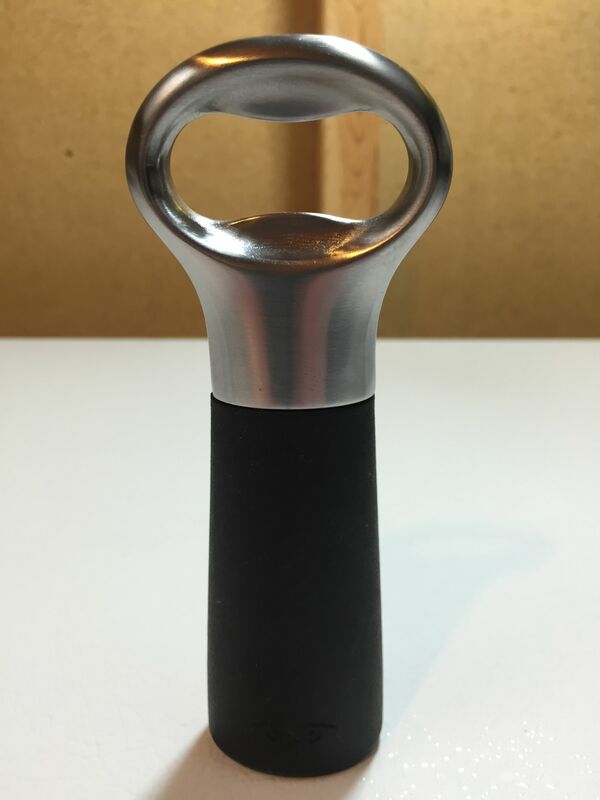 This entry was posted in Amazon, Bottle Opener, Craft Beer, Featured Reviews, HBF Tested, Kudos for Design, Reviews, Reviews & Top Posts on April 23, 2013 by admin. I had this bottle opener and filled a five gallon bucket with flat caps, sadly It has gone missing and I cannot find a place to buy it, please help. I can’t find it in stock anywhere, including on OXO’s site. I’m afraid (although unsure) that it isn’t being made any more. 🙁 If that’s the case, it’s a bummer as this is an awesome opener. I keep my Craftsman opener in the kitchen, proudly displayed on its own hook. SWMBO doesn’t mind (or at least has never made her objections public). lol about the craftsman one. From the top picture it looks as if it can remove the cap without creasing or denting it. Can you verify this is true? I collect bottle caps for a future mosaic bar top, and I only like bottle openers that don’t damage the cap. It does do a great job of keeping caps intact. The trick is to take of the cap with one clean motion. The craftsman is also good at this, although it will leave a small dimple pretty much every time.